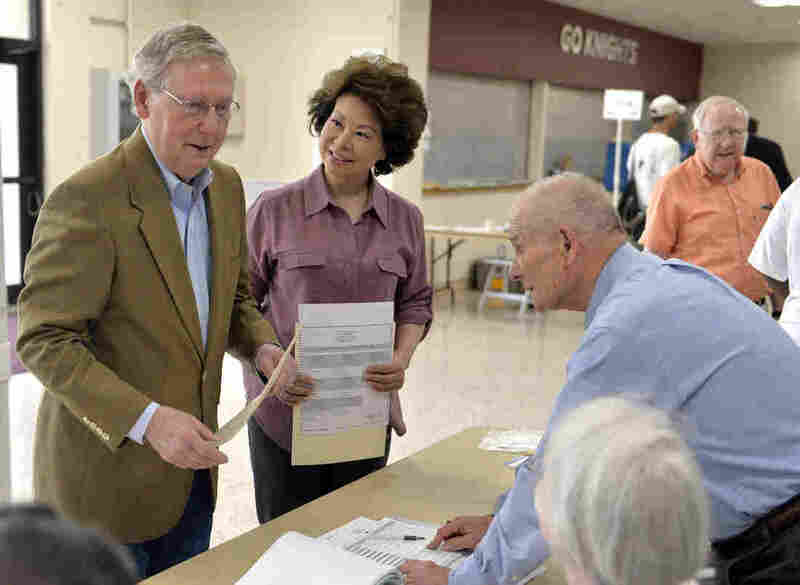 McConnell Wins Big Over Tea Party Challenger In Kentucky : It's All Politics Sen. Mitch McConnell's large victory in Kentucky suggested that he could have a fairly unified party behind him come November. Kentucky Republican Senator Mitch McConnell, left, and his wife Elaine Chao, center, talk with poll workers at their precinct Tuesday, May 20, 2014, at Bellarmine University in Louisville, Ky.
What some called the Super Tuesday of the 2014 mid-term election cycle, with six states holding nominating contests, began with a big win for the Republican establishment. In Kentucky, Sen. Mitch McConnell's smack-down of Tea Party-backed businessman Matt Bevin in the GOP primary was an emphatic victory for the five-term senator, who made this bold prediction about other Tea Party-backed Senate challengers earlier this year: "We're going to crush them everywhere." By defeating Bevin 60 percent to 35 percent, McConnell's clear-cut win suggested he might have a unified Republican party with him in his race against Democrat Alison Lundergan Grimes, who, as expected, also won her primary. Recent polls have placed McConnell and Grimes in a statistical tie, in a contest likely to be the most expensive Senate race in the 2014 election cycle. McConnell's victory reflected foresight and political adaptability. In 2010, his preferred candidate for an open Senate seat lost to Sen. Rand Paul, the Tea Party favorite that year. Four years later, not only did McConnell beat a Tea Party-backed challenger, he did it with Paul's support. In Georgia, where none of the candidates were anywhere close to the 50 percent threshold necessary to avoid a July runoff, David Perdue, the former CEO of Dollar General and cousin of former Georgia Gov. Sonny Perdue, finished first with 31 percent. He'll meet second place finisher Rep. Jack Kingston, chair of a House Appropriations subcommittee, who won 26 percent. Like David Perdue, Kingston represented the traditional conservative establishment. He finished just ahead of Karen Handel, the former Georgia secretary of state. Handel, a former senior vice president for public policy at Susan G. Komen for the Cure, was one of several Republicans in the race who represented the GOP's Tea Party wing. Rep. Paul Broun, who attracted national attention for his infamous comment that evolution and the Big Bang were "lies straight from the pit of hell" and Rep. Phil Gingrey. The four other states with primaries were Arkansas, Pennsylvania, Idaho and Oregon. Pennsylvania's primary to decide the Democratic nominee for governor resulted with businessman Tom Wolf winning by a wide margin, as expected. He captured 58 percent of the primary vote, while the woman once thought to be the frontrunner, Rep. Allyson Schwartz, was far behind in second place with 18 percent. In another Pennsylvania contest, Democrat Marjorie Margolies, whose son is married to Chelsea Clinton, lost in her attempt to regain her old House seat. Schwartz, who has held the seat gave up her chance at re-election to the House to run for the Democratic nomination for governor. Brendan Boyle, a state representative, beat Margolies in the Democratic primary despite the help she got from President Bill Clinton who cut a campaign ad for her. In Arkansas, Democratic Sen. Mark Pryor and Republican Rep. Tom Cotton, his challenger, both won their party nominations. In Idaho, eight-term congressman Rep. Mike Simpson defeated Tea Party-backed lawyer Bryan Smith, who drew early support from the Club for Growth but found that backing waning as the Chamber of Commerce and other establishment groups rallied behind the incumbent. Oregon's Republican primary featured Dr. Monica Wehby, a pediatric neurosurgeon, and Jason Conger, a state representative. In the final days before the primary, Wehby's candidacy was rocked by allegations that she had stalked an ex-boyfriend and that her ex-husband had complained of her post-divorce behavior as well. The impact of that late-breaking controversy on the race appeared to be minimal: Wehby won the nomination anyway, winning 53 percent of the vote.